7 years ago, we decided to try for a baby. 4.5 years ago i invented you. i know you are not real, you are a figment of my imagination, but when im desperate, when i need someone to talk to/vent at/be cross with, there is no one in real life i can blame, so you came into existence. I used to ask you to let the IVF work, all i wanted was a BFP. how naive i was eh? i thought a BFP meant a baby, but you proved me wrong. My 4th IVF cycle saw me get pregnant for the first time, i was overjoyed, we had cracked it. Or so i thought. in a cruel twist of fate, at 20 weeks Milo was diagnosed with HLHS and we opted to end that pregnancy. it was the right thing to do. My 6th IVF cycle saw my second BFP and despite a few hiccups, Millie was healthy. but 9 days after finding that out, you took her away. Why? was it punishment for Milo? is is punishment for a past life? is it a test? are you trying to tell me something? If so, could you be a bit more clear about it please? we had a year off, my head was battered, my heart broken, i was a shell of the woman i remember myself to be. it did me good, i got my strength back and i didnt think about you at all. In May we got back on the train, yet again you are not happy with me, first throwing a freeze all in my way and then a BFN on the resulting FET. Now im planning cycle 9. What do i need to do to please you? What do i need to do for a take home baby – ill do anything, i just need to know what. Im so sick of being the strong one, the positive one, the patient one. its got to be my turn now? i try to get on with life, in between cycles, you know? but i know you are always watching me, deciding if ill ever get my take home baby. I can feel you there as all i think about is the upcoming cycle, and what to try this time. if you let me get pregnant, i promise not to buy a thing until im near term – will that please you? ill give more to charity, ill help more in the community, i WILL adopt as a thank you for letting me have my own biological child. i just wish you were real and i could offer you something so you look favourably on me. but of course, you are in my imagination. there isn’t anything or anyone that can assure me a healthy baby, or even a pregnancy at this stage. but wouldn’t it be wonderful if you were real, and i and all the other infertile/bereaved parents, could know what you wanted to ensure the next pregnancy is a safe one. So basically, Take Home Baby Gods, this is my prayer to you. im out of money, im out of holiday and im out of steam. ive got enough left for one more shot at this. no one will love a baby more than we will, no one will ever be as grateful as we are, no one baby will have as many aunties and uncles from around the world. Please, please please, just let it be us. please? The last couple of days in Cyprus were a bit hectic hence my absence. On Tuesday we met up with a lovely couple we had met in clinic and had coffee for a couple of hours. The lady and i have very similar issues and have been through a lot of the same things and it was nice to chat about our experiences and also how positive we are regarding Team Miracle. They are finding the journey hard, which it really is but i hope i was able to offer some comfort and positivity. That night we were with friends for dinner….and the football. Im not a football fan but my god have i seen a lot of matches of Euro 2016. My conclusion is, England are a weak team, Wales are doing brilliantly and the under dogs (like Turkey) are fighting hard. But thats just my opinion and im not wanting to start a war!!! The flight back was fine on Wednesday, although i did have to order more food despite paying for a meal. These steroids are making me HUNGRY!!! And then i got Mr Me to cook a full meal at 10pm…😲😲😲 least its good healthy food from Hello Fresh!!! Its AMAZING to be back with Mr Me. Missed him so much, it was worth it but i really dont like us being apart so that won’t be happening for as long as i can help it. Mum was a wonderful substitute mind, and took her duties of keeping me calm and bringing me home preggers very seriously! Im 4 days past a 5 day transfer, or 9 days post ovulation on a traditional cycle. Other than the tugging, ive had some very mild cramping and some crazy dreams so far. Nothing much to report but i do tend to be fairly symptomless on my 2 week wait. Im staying super positive though, i have every faith this will work. Back in the office tomorrow and then a 3 day weekend as normal, this 2 week wait should fly by. She says now. I tend to sail through the 1st week but the 2nd week is tough!!! Watch this space. Today in the UK its the EU referendum, ill be voting REMAIN. I urge all my UK followers to use their vote and if you are not sure, vote to stay in, a leave vote cannot be undone whereas a remain vote can be revisited. Enough politics but please dont waste your vote! Im sooooo excited to watch Game of Thrones later, it has been a mission to avoid spoilers but we managed and i know its a cracking episode!!! Cant believe its nearly over for another season! I intend to take today easy, the embies should be implanted by now, its the first 48-72 hours that are important but another day of relaxing cant be bad! We arrived yesterday evening. Flight was great and transfer was ready and waiting…in a tiny car with 2 massive suitcases, funny! Within half an hr, a cushion and a chair had blown into the pool which i then had to rescue! Went for dinner, got back in the car, no sat nav as phone had died so it took me another 40 minutes to find the supermarket and then over an hr and a half to find the villa again. Pitch black roads with no signage are to blame. We drove past the street we need to use at least 4 times as the only thing we were told was to look for a tiny sign which is black and white and not lit at night!!!! But we got home….in the end! Today has been a weird one as when i took my antibiotic this morning it sent me into a throwing up frenzy…coupled with the heat…not a good time. Eventually a nap and a sandwich sorted me out but, yuk! Im fine now and just need to be more careful tomorrow. I think im having a scan tomorrow…im very dubious about my lining but the team have told me to stay positive and given all the meds, im sure it will be fine. Just about to get ready to go out but i have to say, i don’t think i could manage a cycle in the heat of July/august so im soooo glad i got to come back now. So….im underway with cycle 8. My period arrived a day early on Friday so as of Saturday ive been prepping for what will hopefully be the last IVF cycle of my life. I booked a trip to Alton Towers to encourage my period to show up on time (not that i needed it) but it was so much fun, im so glad we went. We went to the roller restaurant where all the food comes to you via rollercoaster too. It was very cool. Normally im really good on rollercoasters but i have to admit i felt rather ill after each one…im hoping its the wine from the night before!!!! It was a lovely 24hrs tho, nice for Me and Mr Me to have some time together since hes not coming to Cyprus. It has to be the most comprehensive protocol ive ever seen for an FET. Which is reassuring if not a little confusing!! So, we fly on Wednesday, Mum and I and transfer i THINK will be 19th but things can always change so its not set in stone. Ive stopped caffeine and alcohol again as they can hinder lining growth. I have added in raspberry leaf tea and brazils in an effort to help my lining get thick as im slightly paranoid as my lining has let me down on previous FETs. However as above ive never been on such a comprehensive protocol so i can see why the team are not worried! My alarms list is already pretty big… and we havent even got to the 14th when the regime really steps up, but it is nice to feel like im doing something again, and im super excited to get my embryos back on board!! Im still exhausted come morning and im SO looking forward to a lie in at the weekend. I could easily sleep 11hrs at a time at the mo!! Lastly im super thrilled that i have hit 8 stone!!!!! Its taken weeks and weeks but ive done it. Ive not been 8 stone without being pregnant since i was 16/17 and the bullies told me i was fat in a size 8!! I cant blame my anorexia on those sad, silly girls though. That came about as a form of control and is more linked to my mental health…but they were the trigger. School kids can be cruel and words hurt so if youve nothing nice to say just dont say anything. Please. So its been a whirlwind since we got back to the UK. I dont think i realised how emotionally hard the trip to Cyprus had been but since getting home we have been exhausted. Im still quite tired if im honest but ive picked up a chest infection so thats added to everything. Im all booked to go back in mid June. Im so excited to go back and get my embies back where they belong but of course time is dragging. I have now stopped my contraceptive pill so we are awaiting AF (period) to arrive so i can start the FET (frozen embryo transfer) prep. Fingers crossed itll arrive Saturday but just to ensure it does ive booked a weekend at Alton Towers. We go down Friday to stay in the enchanted forest and then we will spend Saturday in the park. Ive also booked us into a new restaurant where your food arrives via a ‘rollercoaster’ so that should be pretty awesome. This is to help pass the time but also so Me and Mr Me have some quality time together as he wont be on the return trip to Cyprus. We also learnt during our year off that quality time is so important to stop us drifting apart so we intend to keep up these weekend breaks to stay connected. Will be looking at country manors more than theme parks in the future, all being well. I made a firm friend in Cyprus and we have been keeping in touch which is lovely. I now have so many IVF friends which in a way is amazing as the bond is so strong but its also a little surreal given how taboo the whole subject can be. Its amazing to have these ‘real life’ friends rather than online friends, i mean we are spread out all over the country but its nice to Whatsapp someone who gets it rather than awaiting a reply on a forum! 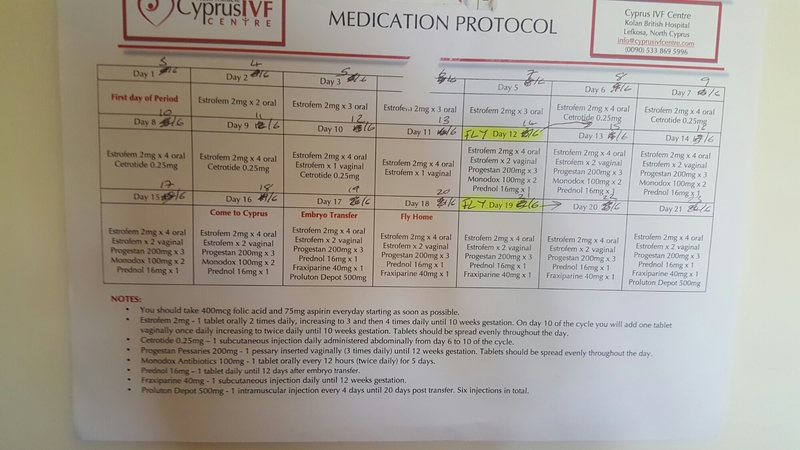 I visited my counsellor the week after i came home and as i told the story i could see her getting emotional and it was her tears that made me realise that we had had quite a tough time and that it was most definitely a rollercoaster of emotions but my response is always the same ‘that’s IVF, its not simple or straightforward’ and in terms of highlighting that, this delayed cycle is ideal evidence, but again, i was told to stop thinking of others! I really got her going when i explained Dr F is timing my pregnancy so i give birth in February but i knew that would be an emotional moment as even i got emotional when she told me and i dont do emosh! I have made a point of seeing my friends before i go back and this last weekend i went to Junkyard Golf with our friends and it was awesome. Whole course is indeed made of junk and you can have a lil drink to make it even more fun…plus i WON! Which never happens, mustve been the booze. Im now back on my clean living diet as caffeine and alcohol can affect lining thickness and ive had trouble with lining on FETs in the past. The clinic arent a bit worried but i am going to be doing some extras just to help it along…raspberry leaf tea to improve lining thickness, brazil nuts for the selenium, and i was hoping to have some acupuntucture but neither therapist i contacted have got in touch so that may not happen! I have to admit that im having the occasional flash panic about being pregnant again but i quickly remind myself i actually need that BFP before i worry about anything!!! And im able to stop it rather than having it negative spiral out of control. Counselling is definitely paying off. 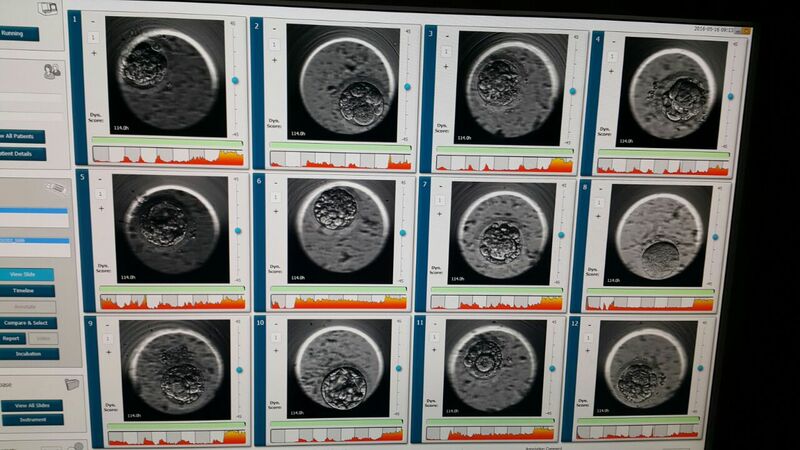 So yesterday we were told the epic news that a whopping 7 embryos had been frozen. I still cant quite believe it!! Best results we have ever had in 3 fresh cycles. Im over the moon, truly! The original plan was that i would start preparation for the frozen transfer today but when we got to clinic the plan changed! Im to start the pill today to control my cycle…the reason for this? Well, its all because of March and what it means to me and Mr Me. Its obviously not a cursed month but given I’ve lost 2 babies in March, i kinda wanna avoid it. Now most doctors wouldn’t give a damn about this, but Dr F is incredible. She’s timing my cycle so ill give birth at the end of February. What a woman!!! Im so very grateful to her for this and so many other things. So ill stay on the pill from today to the 31st May. Stop. Have a bleed approx. 4 days later, and start meds on cycle day 2. I haven’t got the full protocol yet so im not too sure what im taking when but it’ll be with me soon. I have come away with a bag full of meds today, including the pill, cetrotide (to stop ovulation), estafam (to build my lining), progestan (progesterone to support the upcoming pregnancy), prednisone (a steroid to stop my immune system attacking the embies) and monodox (doxycyline an antibiotic to stop infection). Despite many protests, I’ve also paid my freezing costs and meds cost and apparently im now paid up! They are so relaxed about payment with me, but being a Brit, i like to pay for services as they happen. I had made a load of enquiries about villas etc for the earlier dates but luckily didn’t book anything, although i will have to rearrange my holiday at work as i gave my manager notice of the earlier dates yesterday! Oops! Sorry! We are currently sat in our favourite coffee bar where im enjoying my last coffee. I need to stop again to ensure my lining grows, stimulants aren’t good for that. So thats it, fly home tonight after an amazing 10 day rollercoaster! Im so ready to see my fur babies and watch the last 2 episodes of Game of Thrones…we have being trying so hard to avoid spoilers! Day 5 update and a little surprise!!! Ok so we’ve got to day 5! Woop! All 11 still going….WOW!!! Number 10 is a perfect blastocyst!! The others are doing well and over the course of the day we should get a few more reach blasto. Ill get an update later on how many we will freeze! But…oh.my.god!!!! This is AMAZING!!!! My best ever cycle!!! The embryo development has been superb! And the surprise? AF (period) arrived today….11 days early but it should mean i can start prepping for the frozen transfer TOMORROW!!!!! Ahhhhhhh so exciting. Massive thanks to Team Miracle!!! So we had our 1st visit to clinic today. Met up with 3 ladies from babycentre whilst there which was awesome. 3 of us had scans today but only 2 of us a progressing to transfer. Who isnt? Me! As suspected as soon as i saw the dose, im overstimmed and estrogen levels are too high to do a transfer. What will happen instead is that my eggs (20+ follicles on each ovary) will be collected, fertilised and frozen on day 3 and ill come back at a later date for transfer. I was truly expecting this so im not sad, although i do worry im going to struggle to get back into the right head space, but anything is better than OHSS and being poorly. Ill either come back on my own for a night, or bring my Mum for a week, ill have to see how quickly i feel i want to do it i guess. So ive just taken my last stimulation dose and will be doing the trigger tonight at 11.45pm. Next trip to clinic is wednesday morning for egg collection and then im done! A whole week of just holiday, no more meds, can have a drink and really enjoy ourselves. It is disappointing, but also the right thing to do. I just need to stay in the mindset….but im fighting it all the time. It was truly wonderful to see Umit and Dr F again and im sure i regonised the nurse too but dont know her name! So drug free from tomorrow really, eggs out wednesday, home the following tuesday and jobs a good one.